Chair in the Shade: Musical Mondays- Jenny Lewis' "Just One of the Guys"
Musical Mondays- Jenny Lewis' "Just One of the Guys"
As soon as I saw the video for this song last week, I knew it was destined for Musical Monday. Jenny Lewis (who was also the lead singer for Rilo Kiley) enlists Kristen Stewart, Anne Hathaway, and Brie Larson. I'm not a big K-Stewart fan, but I do think Anne Hathaway is pretty awesome, and all three ladies do a great job in this video. Read the comments on Facebook and you'll read everything from people saying it's a feminist self pity anthem, to how women should just have babies, to how hot Kristen Stewart is and how sucky they think the song is. You can draw your own conclusions from the song, but to me, it's a song about trying to fit in, when all your friends seem to be procreating. I know sometimes it feels like you're the only chick not having a baby. I'm 31, and unfortunately (for my mother and her dreams of grandma-hood) having a baby isn't in the plans right now. It seems like every day on Facebook I have friends with babies posting "things people without kids should never say to parents" and baby-less friends posting "annoying things friends with kids do". Has it always been like this is or is the internet breeding this new "frenemy" type animosity between those with children and childless? I don't know, but they certainly are two different social groups, both with pros and cons, and most of us have to function in both because we have friends with and without children. So to all my childless friends- don't let anyone make you feel like you have to have a baby just because you're a girl, or you're a certain age, or you've been in a stable relationship for x amount of years. And if you're trying to have a baby but not having any success, remember your worth as a woman is not measured by being able to push a watermelon sized human out of your uterus. But honestly, if you dream of holding a little baby of your very own, I wish you nothing but success and happiness. 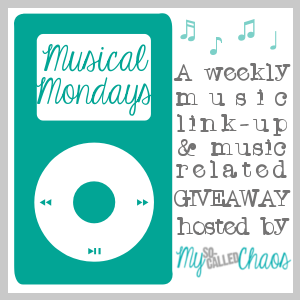 And don't forget to head over to My So Called Chaos for Musical Mondays and see what everyone else is listening to! Hmm, I like your take on it! I didn't think of it that way, but you're totally right!